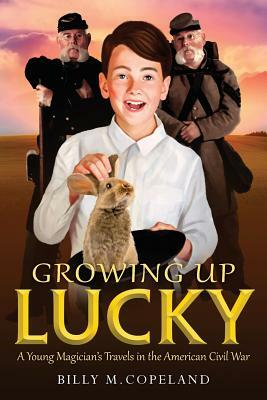 "Growing Up Lucky" is the story of a young man who grew up lucky at a time of great conflict and against all odds...based on the true-life adventures of James Michael "J.J." Willard. When nine-year-old James Michael "J.J." Willard finds himself bumping along in a covered wagon, with his father, mother, two sisters and all their worldly possessions, he has no idea of the adventures that lie ahead. The family is leaving its home in Brooklyn, New York, heading south to New Orleans. The year is 1861 and the War Between the States is just beginning. They stop in townships along the way to sell "Willard's Magic Elixir" - an old family recipe - to pay for food for their journey. Arriving in New Orleans they are confronted with the full horrors of the civil war, and to avoid being caught up in the brutal conflict the family decides to lie low on a small farm outside the city where they brew their potion and work on their sales patter. They entertain crowds with a few simple conjuring tricks and quickly discover that J.J. has a natural gift for performing magic. By the time the war is over the Willards are putting on weekly magic shows in New Orleans and J.J. is the star of the show. Offers start pouring in and before long the talented young magician is performing on Mississippi riverboats and famous clubs all over the United States.